Interested in Family Portrait pricing? That's coming soon... for now, you'll have to send us an email, text, call or fill out the inquiry form and specify Family Session until we get our pricing onto the web! When James and I were engaged and started searching around for a wedding photographer, the common practice of "hidden pricing" was incredibly frustrating to us. When I was blearily browsing around on photographers' websites at 1:00 am, I was confounded by how much WORK it was to find out the cost of their services. Almost everyone required me to send an email or fill out a form. A few had some "starting at" prices, which was better, but I still felt a little exasperated not knowing what I was walking into. And I get it. Sales strategy is a big deal and for many photographers, that structure has helped them make a lot of money. Except... James and I hate sales. We like creating art. We like building friendships with our clients. Having a complicated "sales strategy" was a huge roadblock between us and the people we wanted to connect with. So when we started building Shutter Force, we knew that transparency and upfront pricing was going to be a big part of how we operate. It allows us to leap right on beyond the uncomfortable conversations and right into the "let's get excited about your wedding" part. So, we created four wedding packages to choose from. All our pricing includes everything listed within a package, except tax (currently 7.688%). EVERY package is customizable. Most couples mix and match to create their perfect combination for their plans and budget. We move things around a LOT. But we also know most couples don't really know where to start (as if wedding planning isn't already overwhelming!) so the four packages are home base. We love to schedule in-person meet ups (or Skype dates! ), either over coffee or drinks if you're so inclined (New Mexico has the BEST breweries - hint, hint!) to talk about what each offering entails and craft a custom package. We still offer an a la carte menu for prints, albums, wall art and additional hours, but a consult is the best way to go over any of those options. Our most popular package by FAR is "The Storybook," ringing in at $3,285 plus tax. 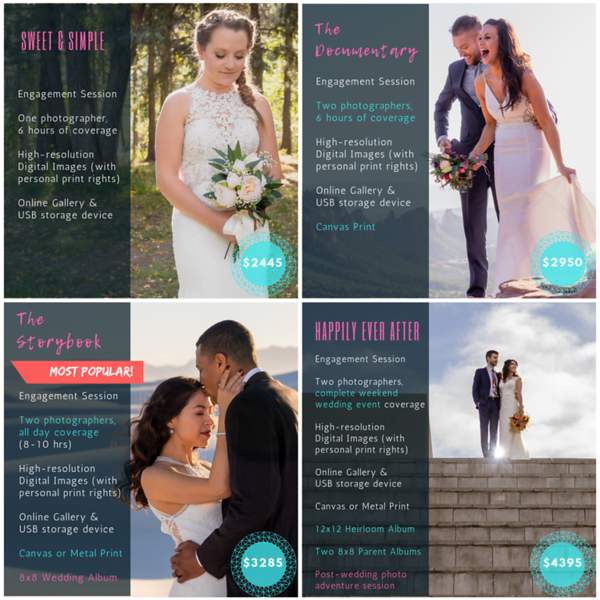 This gives the best amount of coverage for your wedding day, with both James and I shooting together, while also including a custom album and the wall art piece (which is a client favorite every time). It's the most value for your investment, unless you go the full "Happily Ever After." All our packages include an engagement shoot, but some couples choose to swap that out for an Adventure Shoot (send me a message if you'd like to learn more about this cool session!) or we can adjust the pricing without one. We think they're the best because it's like a warm-up to get to know what it's like to hang out with us and our cameras, and we get the chance to know you better too. Interested in more coverage or whole weekend event photography? Check out the "Happily Ever After." Having a smaller ceremony and aiming to save a bit? "The Documentary" might be more your speed. We're more than happy to walk you through all your options. Like I said in the beginning, we really care about being transparent and competitive with our pricing, and we want everything to be the right match for your wedding. From our personalities to our package options, our goal is to make sure we're the right fit for you. Your photographers are the vendors on your wedding day you'll spend the most amount of time with... it's amazing how exponentially better your day will be when your photographers are the right match for you. Your photos! Yes, we do give you the high-resolution digital images that we've edited. Woo-hoo! On average, we deliver 300-500+ images, depending on the length of the day and number of events photographed. Sometimes we deliver 800. Every wedding day is different. We've found from our experience that once you get into the 1,000+ range images of your wedding day - things start to get pretty overwhelming. Ain't nobody got time for that! There's a huge value in having professionals narrow your day down to the best of the best, and that's where we come in. We also issue you personal printing rights, so you can print and share your photos where you want and with whom. We choose not to watermark our images, so you get to enjoy them all, just as intended. We do retain the commercial copyright, so if you want to use them in a particular way (like for monetary value or on a billboard) you'll just have to get in touch with us first so we can make a plan. Since you'll own the personal print rights, you aren't limited to using our printing house partners, but you can still order the highest quality prints through us: directly from your client gallery and they'll even be delivered directly to your house. It's wicked easy. You can even order wall art like canvas or metal prints or other photo gifts right from your gallery. The booking process with us is also really simple. We email you an official quote. When you review it and click Accept, we email you our contract to review and sign with your first invoice, for a 25% non-refundable retainer required to lock in your date. The remaining balance is due 30 days prior to your wedding date. Many couples choose to pay over installments, which is quite easy to do also. And that's it! Then we get to move on to scheduling your engagement shoot and starting to get excited for your wedding day. Let's meet up! Call or text us at (505) 309-0835 or fill out an Inquiry Form. We'd love to hear from you and start planning your amazing adventure with you.